Sooooo . . . 20 months really flies by, huh! Here’s a brief recap of that time: we prepped our house to sell, listed it, sold it in 3 days, moved in with friends, moved across country to our new house. I was going to do a before/after for the whole house . . . and then got distracted! We’ve been in this house for almost exactly a year now, and I finally decorated a room! This time I started with the boys room – it was time for Jelly Bean to finally get out of that crib and into a big boy bed. Let’s get to the good stuff: the pictures! After! (if I was a professional blogger, the before pictures would probably be crummy, and the afters amazing. But I’m just a casual one, snaping pictures with my phone. But I cannot even express how happy this room makes me! So here’s what I did: painted the whole room Sherwin Williams Repose Gray. Moved the furniture around so it fit better. Hung up a bunch of stuff. Sewed a quilt and a pillow(Buddy’s is the same as the last house, I just made a second one for Jelly Bean) That’s really it. It took me a year because we didn’t want to go into debt for anything, so it took saving up for a while and then I’d buy one big thing. Or a couple of little ones. Pictures are from pickyourplum.com, frames are the Fiskbo series from ikea. Magnetic dart board is from bed bath and beyond. I made the “you are my sunshine” sign above the closet door. magnet boards next to the window were a dollar spot find at target months ago - they were super ugly, but a little paint helped that out! I even attempted a couple of panoramic shots for you: we start at the door to the room, go clockwise around past the closet, window, dressers, bunk bed to end up at the same door. So I didn't move at all numbers wise this week. But actually, that's really rather a victory for me. My kiddos had 3 days off of school last week, so we went on a whirlwind trip to visit family. I wasn't great either. I had McDonalds twice (mmmmm bacon egg cheese biscuts for breakfast). I had a gloriosly greasy sandwich and cream soup. I discovered that my mom's awesome fudge is A. MAZE. ING if you schmear some peanut butter on top. But with all of that, I broke even. Because I also was sensible for my regular breakfasts. I paid attention and stopped when I was feeling satisfied (I'm actually leaving food on my plate!). I let myself eat what I wanted, but never went overboard. For me, this isn't just about loosing weight. I don't feel like I'm on a diet. I'm changing my life. I honestly plan on eating like this for the rest of my life. Granted, I won't always be activly trying to loose, so I'll add back in some points. But to get to the point that I know when to stop, that I can indulge but not regret it, that is just huge. I haven't been below 200 since 2010. This is an ENORMOUS victory for me. It was a small actual loss this week, but the mental high of seeing a 1 first instead of a 2 is indescribable. I've tried so many times to eat healthy, to get this weight off, to get moving, to do what I needed to be a healthy me. But it never really worked, mostly 'cause I would only stick with it for a couple of days. But this, this is the start of an actual life change. I will get healthy. I will get fit. and I will be awesome! So we had to buy a new van. I'm super excited/super frusterated about the whole thing. I've hated my old van for about a year. It was ALWAYS in the shop; I couldn't ever trust it. It had a lot of miles and was falling apart in places, and parts were getting really hard to find for it. But it was paid off. It was all ours. I knew how to do everything with it. I didn't care about where I parked it because it didn't matter if it go scratched or dented or whatever. Our new van is 7 years old, but has such low miles it's like it's only 2 years old. We got an amazing price on it. It has a rediculous number of extras on it. It has much more space inside so my kids don't hit each other. But it means a signifigant car payment. And I don't know how to use all the extras. And I'm scared that I'll get in an accident or something. I'm not really a fan of silver. Everyone has a silver car. I liked that my old van was unique; I could always pick it out. This one, not so much. So I needed to change that. I asked for input on Face book. I googled (a LOT) for ideas. And I finally found MarkedCo on etsy. Super fun, nice and quirky. Adorable ideas. I asked her to customize something for me (just a little customize. It was something designed for a laptop, and I wanted it car sized). She was super easy to work with and got my stuff to me quickly. And I made my mini van AWESOME. This is on the rear passenger window. I think it's my new motto. And wonders over to the back. And ends with a tiny little wand as my fake wizard dissapears. I love it. And I can find my van now. It makes me super happy! I hit twenty pounds this week. I actually crossed the 20 pound mark! I kind of felt like I had a mental block against this number (which was my way of explaining why all my losses have been smaller for the last way too many weeks). But lots of prayers were said (man, I'm struggling remembering that again! ), and I buckled down and had success. I don't have a lot of hope for this next week. Those stupid pills are by my nightstand again, so I'm starting that whole pms thing again. But that's ok, even with set backs, I've still lots TWENTY POUNDS!!!! If I loose even .2 this next week, I'll be on a new 10's place on my scale. And I'll see a number that hasn't been there for almost 4 years. Oh how thrilled I am about that idea! I don't understand what happened this week. I was good (not perfect, but good) with my points. I didn't have any bad eating days, just regular ones. I don't understand how I could be up this week. Especially after my emotional high of last week. I kept that in my mind all week did lots of praying, but still I'm up. Hmmmm. I'm going to have to think about this one. Maybe it's just a fluke and I'll be down lots tomorrow? Timing wise, I'm 3 months into this 6 month journey. And I'm not as skinny as I "should" be. But I'm a completely different size than I was in June. And that's a wonderful feeling. So I'll focus on that, and not the negative! I've wanted to redo my kitchen since we moved it. Not a full gut or anything, just do some rearranging and a new color scheme. And we finally got to start it! I know, I know, it looks worse now than before. But it's a process, remember! So we took out the two HUGE cabinets (I did the one, by myself, and moved it to by the dining table. That was nuts, but then you already knew I was). Then we had someone come and plum it for gas, plus run some different electrical for us. Then my new stove was delivered (fridgidare, gallery series, I'm in LURVE!) My Hubby and Dad hung up a couple of shelves, just so there's a place to stick the microwave until we get further down the road. I'd like to take off the rest of the original wallpaper - in the words of my 9 year old "how did anyone ever think something so ugly was in style!". And tape/mud the drywall and fix the holes, and at least paint the silly wall. But we'll see. It might just have to wait for way down the line! So here's the steps, and aprox dates for completion at this point. 3. New floors (wood? sheet vinyl? who knows) by Christmas/end of Jan ish. 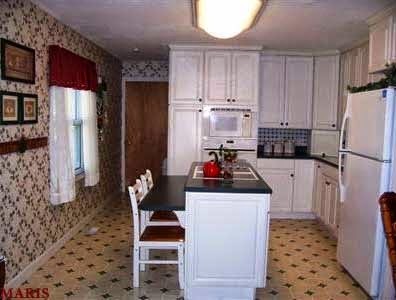 6. replace backslash, paint, and make it all cute and finished: by spring 2016. Like I said, the worlds slowest kitchen remodel. But that's ok - we're doing all of this as we have the money. And it will be great when it's done!